World Dream is home to 35 restaurants and bars. As with Genting Dream, the focus is on Asian cuisine, but you will also find options from all over the world. On the Chinese food front, there is fine dining to be had at Silk Road, the al fresco eatery Hotpot and the vast Dream Dining Room. The food court dubbed Blue Lagoon serves up South East Asian cuisine. Umi Ma is the signature Japanese restaurant which is complemented by offshoots Umi Ma Teppanyaki and Umi Ma Sushi Bar. On the international front, there is the Palace Restaurant, Prime Steakhouse, Vintage Room, Seafood Grill, The Lido buffet restaurant, health-conscious Crystal Life Cuisine and the Lobby Cafe. 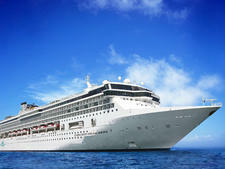 The cruise ship has a total of 1,686 staterooms, with 70 per cent of these offering ocean views. The cabins are split into categories including Balcony Stateroom, Balcony Deluxe Stateroom, Inside Stateroom and Ocean-View Stateroom. At the upper end of the scale, there is the Garden Penthouse, Dream Executive Suite, Dream Deluxe Suite, Dream Suite and Palace Suite categories. The Palace 'ship within a ship' concept includes 'special privileges' including the butler service for which Dream has become renowned. Like sister ship Genting Dream, World Dream has a lot going on up there on its Top Deck. We're talking a water park complete with six slides of varying speed, a ropes course with zipline, a rock-climbing wall and mini golf course. This is also where you will find the swimming pool complete with kids' water park. World Dream is home to the ESC Experience lab -- a virtual reality playground featuring a wide range of games that cater to the entire family. Experiences include a customised rollercoaster ride, flying high above a mountain range and navigating the twists and turns of a maze. There's also a concert program that features some big-name entertainers as well as a range of shows including musicals, dance and Dream's China's Got Talent extravaganza. If you fancy watching a movie, there are plenty of places to do it -- the Lobby, the 3D Zodiac Theatre and the Zouk Beach Club where you can take in a film under the stars. Zouk is also the place to head if you fancy cutting some shapes: they host daytime and nighttime dance parties here. World Dream has more than 100 connecting state rooms designed to cater to family groups. There are also plenty of activities the whole family can enjoy together. For example, all of the facilities on the top deck are perfect for some family fun: you can hit the waterslides; climb up on the rope courses; scale the rock-climbing wall (for kids over 140cm); and have a putt on the mini golf course. There are other ways to get active together at the Sportsplex where you can play basketball, volleyball and football. Virtual Reality is the name of the game at ESC Entertainment Lounge, or kids can take on the Reach for the Stars junior talent show. They can also spend some time at Little Pandas', the kids' club where they'll try their hand at a range of activities such as pizza-making. 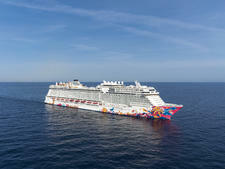 World Dream will sail to destinations including Japan, Vietnam and the Philippines from its Hong Kong/Guangzhou homeport,.